This custom VW Beetle-inspired beauty could even go into production if there's enough demand. As one of the most iconic cars of all time, the Volkswagen Beetle needs no introduction. Over 21 million have been built over the last 65 years, and while its shape is instantly recognizable, it’s far from the sleekest car ever made. A German tuner has finally changed that. Meet the Memminger Roadster 2.7, a modern take on the classic Bug. The result is easily the best-looking Beetle we’ve ever seen. The company has done a commendable job successfully transforming the iconic compact into a two-seater roadster. Squint, and you could almost mistake it for a vintage Porsche 356 Speedster. Memminger’s founder, Georg Memming, started restoring classic Beetles back in 1992, and this is now the company’s core business. Hailing the Memminger Roadster 2.7 as an authentic Beetle might be a stretch, though. The body parts are totally different, and the car rides on a fully welded tubular chassis with MacPherson struts up front and trailing arms in the rear. We also don’t think the tires or wheels were part of the original Beetle’s options list. The Roadster rides on custom 18-inch wheels wrapped in 225-mm wide tires at the front and 255-mm wide at the back. The only parts that look original are the taillights. The biggest change, however, can be found under the hood. 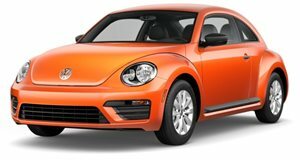 Gone is the original Beetle’s measly 1.6-liter, 60-hp flat-four, replaced with a 2.7-liter flat-four based on the VW Type 4 with extensive modifications. The mid-mounted unit is good for 210 horsepower and 182 lb-ft of torque. Other upgrades include disc brakes from a classic Porsche 911 and reinforced suspension. No technical details have been provided, but the Roadster should be pretty brisk off the line given that it only weighs 1,763 pounds. Inside, the interior is bare to say the least—you can even see the exposed tubular frame, harking back to vintage racers. For now, the Roadster 2.7 is just a proof of concept, but Memminger is considering putting it into production with a limited run of 20 units if there’s enough demand. Let's hope so, because the .